3…2…1…Blast off! Take your summer manicure out of this world with China Glaze Hologlam, an all new 12-piece collection of shimmering holographic nail lacquers. 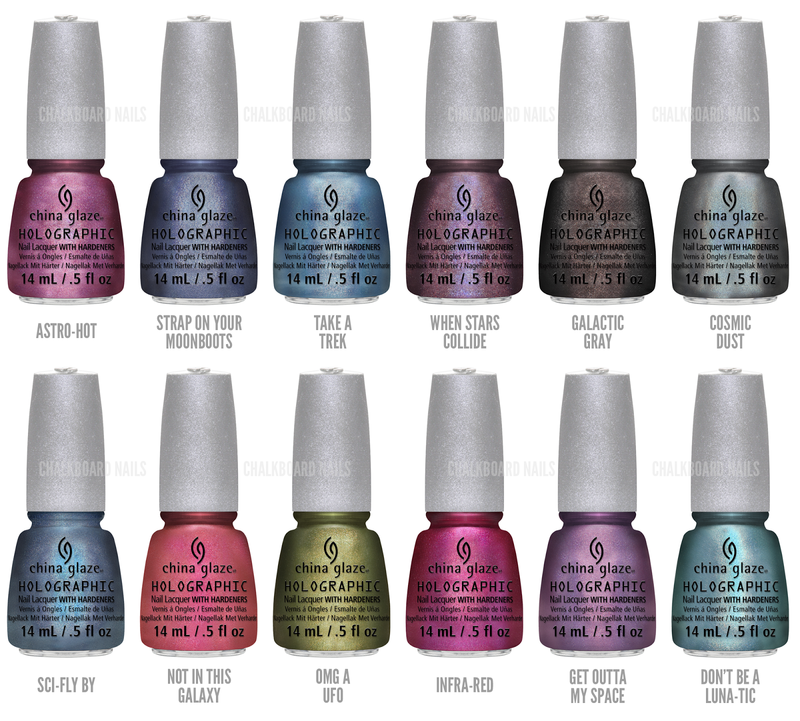 China Glaze established itself as the leader in holographic nail lacquer with the 2007 OMG! collection, one of the most popular collections in the brands’ history. Fueled by that success and back by popular demand, China Glaze Hologlam uses reflective, holographic particles to capture light and transform nails into amazing, ever-changing visual effects. With a strong linear finish whether indoor or shining bright in the sun, China Glaze Hologlam bends and changes, creating an illuminated three-dimensional, traveling color effect across the nail. The China Glaze Hologlam collection will be available in April 2013 at fine salons and beauty supply stores nationwide with an SRP of $14. Wow I want them but at $14 a bottle (and I guess I understand why) is a little much for me. I only spent $8 a bottle on the Color Club ones and those are awesome! Me too. Love my Color Club holos. No sense paying for these. Most of the colors are similar anyway. Just got my first Color Club ...Angel Kiss holo! It is fabulous! $14?! Good lawd! They can keep their holos. I rather splurge on indies. I've been disappointed with what I've seen from blogger swatches. I'm not spending that kind of money after how lame the Tronica collection was. Sally Beauty Supply has them listed for $9 with a Beauty Club Card online, which means they'll be closer to $10 in store, but you can always print off the birthday coupons to save $10 on a purchase of $20 or more. I'm planning on abusing that coupon and hitting up multiple Sally's the day this collection comes out. Traci from TheTraceFace Philes posts the monthly birthday coupons as soon as someone emails it to her. If you go to her blog, the first post is the March coupon. Yay I finally have them all, galactic grey is my favorite of all.